Hello everyone we have an exciting announcement to make! First of all I would like to thank you all for reading our blog, without you guys we wouldn’t be where we are today. So now for the good news, which is why you probably clicked this post in the first place. Groupon have kindly approached us and given us vouchers to giveaway to our fans and regular readers! 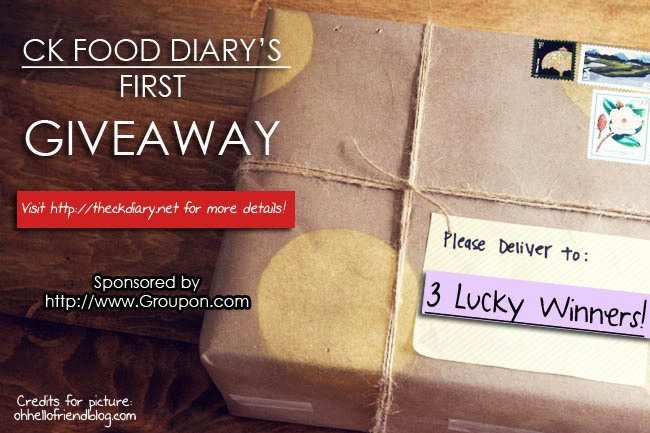 We have 3x $30 Vouchers which can be used on www.groupon.com to give away to three lucky winners. The vouchers can be used on the site for any deals including the dining and restaurant deals. Good luck everyone and don’t forget to like our facebook page for updates on posts and future giveaways! We will randomly choose three winners (see fine print for details). – Please only enter once (Yes we do know if you enter more than once). – We will use a Random Number Generator to pick the three winners. – You must satisfy the ‘how to win’ conditions to be in the draw. – This giveaway is sponsored by Groupon who have provided the prizes. I love the piectures you have for all the places you review, they’re great to look at and they make me hungry!! I find the blog easy to navigate and read. Love the blue colour and the layout. IT IS AWESOME AND THE POSTS ABOUT FROYO AND MACARONS MAKE ME WANT TO TRY THEM MORE. I love how your homepage is tiled with many snapshots of delicious foods, so I can feast with my eyes before I read away! I love your layout of your blog! Please keep posting regularly! Can you both do a review of Bodega?? With the advent of small bars in Sydney it would be great if you could do a review on 2-3 and how the food in them compares, either similar (offerings, quality, etc.) or different. I enjoy the different viewpoints/styles of each of you the most, as well as the clean/crisp presentation of the site and enjoyable style of writing. Would be awesome if you guys reviewed Billy Kwong or somewhere in Darlinghurst. I love Mr C’s giddy facial expression just as he is about to devour some yumminess! No wait…those are his FB photos. Umm…i really love the artsy shots of the menus 🙂 Keep blogging guys! I like the alternating viewpoints between Miss K and Mr C. I would like to have a blog about Mother Chu’s Vegetarian Kitchen. I love the photos and would like you guys to review Hurricanes Grill!